Its time to Kick! Score! Slam! Dunk! Run! 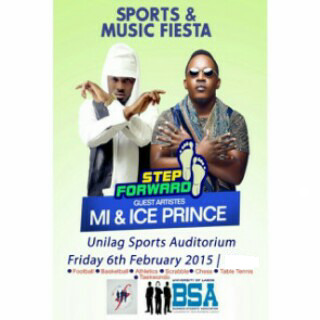 Sing and Dance as chocolate city superstars Mr Incredible MI Abaga, Ice Prince Zamani and other big names in the Nigerian Entertainment Industry storm Unilag this Friday for the Sports and Music Festival. The event put together by Voice of the Youth and the Business Students' Association promises raw actions in sports, music and exhilaration living with smack down performances by the guest artistes. FOOTBALL, ATHLETICS, BASKETBALL, TABLE TENNIS, SCRABBLE, CHESS, and TAEKWANDO. DATE: Friday 6th of February 2015. GATE FEE: Free for all. And guess what! There will be ITEM 7 for everyone. Don't be missed in this fun filled package. Stay in touch with Tayo Lawal to get regular updates on the go; follow @tayolawalblog on twitter or click here to subscribe for free.